Most low income countries no longer charge fees for access to primary education, but primary completion rates remain far below one in many countries (Lucas and Mbiti 2014, World Bank 2018). Many schools still lack important instructional resources and educators often work in civil service systems that provide both robust employment protections and weak accountability practices. Teachers are frequently absent from school and are often not fully engaged in teaching when present (Duflo et al. 20181, World Bank 2018). Many low-income countries engage in accountability practices that can have harmful consequences for many students. More than 30 low income countries use some form of primary exit or leaving exam to certify primary completion. These exam results are often the only student achievement measure that these governments collect and publicize. Therefore, these results are typically high-stakes outcomes for educators. Neal (2018) notes that high-stakes exam systems usually create perverse incentives for educators. Many leaving exam systems are prime examples—in numerous low-income countries, education officials are not able to calculate dropout rates at the school level, meaning leaving exam results are the only public measures of primary school learning outcomes. In such settings, leaders in a school have every incentive to encourage weak students to drop out before they are eligible to take the leaving exam. If they are successful, the public record does not accurately document how many students in the school failed to acquire a primary education. The most effective way to encourage students to drop out is to refuse to promote them to the next grade level. 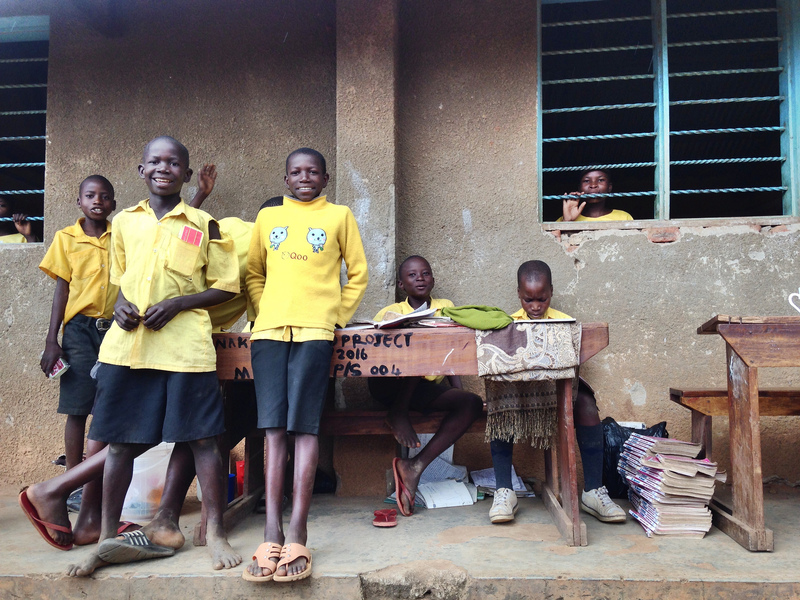 In Uganda, the leaving exam occurs at the seventh and last level of primary school, P7. Figure 1 shows that promotion rates decline steadily after P2 and fall below 60 percent by the end of P6. P6 promotion rates are even lower in rural Uganda. During field work for a recent study, we visited a rural school that enrolled more than 100 pupils at each level below P7. There were only about 50 pupils in P7. The head teacher freely admitted that the sharp decline in enrollment between P6 and P7 reflected her efforts to make sure that no student in her school failed the leaving exam. She was certain that student failures would create negative consequences for her. Uganda is not unique. In Kenya, the leaving exam occurs at the end of P8 and promotion rates drop sharply at P7. In Rwanda, the leaving exam is at the end of P6 and promotion rates decline in P5. Leaving exams may provide valuable information about student readiness for secondary school or employment, but many low-income countries need new policy approaches that will reduce high dropout rates by counteracting the perverse incentives that their leaving exam systems create. In the spring of 2016, we ran an experiment in rural Uganda that paid educators to improve the achievement of each of their students. We hypothesized that, given extra attention, some weak students would improve enough to earn promotion to P7 or at least the chance to repeat P6. Further, among stronger students, extra attention should enhance learning and school satisfaction in ways that reduce rates of voluntary dropout. We began by giving math tests to students at the start of P6, and we returned for follow-up testing at the end of the school year. After students had completed our first test, we told the math teachers in our treatment schools that we would return to test their students again in late October, which is the end of the school year. We also told these treatment teachers that they were eligible to earn up to 20,000 shillings (about $6) for the performance of each of their students. Following the Pay for Percentile (PFP) scheme developed in Barlevy and Neal (2012) , each teacher earned a set of bonus payments determined by how each of her students performed relative to the performance of similar students in other schools. If teacher A taught Sue, and Sue scored better on the end of year exam than 60 percent of the students in other schools who earned Sue’s exact score on the start of year exam, teacher A would earn 12,000 shillings (0.6*20,000) for Sue’s performance. Only 56 percent of the baseline students in our control schools were still attending school regularly. Our PFP treatment increased this attendance rate by four percentage points, to 60 percent. Nonetheless, the test score results from our follow-up at the end of the P6 school year contain no statistically significant evidence that PFP treatment improved overall math scores. Although these results appear at odds with our strong attendance results, we find that when we separately examine the roughly 50 percent of our schools that provide math textbooks for P6 students, PFP raises math achievement on items at or near the P6 grade level by more than 0.1 standard deviations. Further, the overall four percentage point increase in attendance in our second follow-up data is driven almost entirely by a seven percentage point increase in attendance among students in schools that provide math books for P6 students. Our results add to the growing evidence that well-designed teacher incentives can improve performance in rural low-income schools, especially in settings where schools have adequate instructional resources. Muralidharan and Venkatesh (2011) and Loyalka et al. (2018) report results of performance pay experiments in rural primary schools in India and China respectively. All the schools in these experiments provide textbooks for students, and both studies found that that linking teacher pay to student performance improves student achievement. Mbiti et al. (2018) describe a recent experiment in Tanzania that involved random assignment of both incentives and additional instructional resources. Their results indicate that incentives produce even better learning outcomes when paired with improved instructional resources, and vice versa. Our results also extend this literature in a new direction. In most low-income countries, student populations are quite mobile, and education authorities do not have the information systems required to produce credible school-level measures of enrolment, transfers, or dropouts. We show that it is still possible to reduce dropout rates by paying for achievement growth during the school year. Ugandan students recently acquired national identification document (ID) cards. Therefore, education officials could give both start and end of year exams and create measures of achievement growth for all students who are present for both testing days. In this setting, PFP could reduce dropout rates by rewarding educators for each student who is in school on both testing days and for the achievement growth of each of these students during the school year. Further, education officials would be wise to pair this approach with policies that give teachers adequate instructional resources tailored to the current achievement levels of their students (Banerjee et al. 2017, Duflo et al. 20181). Many low-income countries hold educators accountable for primary leaving exam results but little else. This approach almost guarantees high dropout rates. To move from universal primary access to universal primary education, countries must provide key instructional resources for all students and hold educators accountable for the achievement of all students. Daniel Gilligan is Deputy Director of IFPRI's Poverty, Health, and Nutrition Division (PHND) and Leader of PIM's Flagship 4: Social Protection for Agriculture and Resilience; Naureen Karachiwalla is a PHND Research Fellow; Ibrahim Kasirye is Research Director at the Economic Policy Research Centre (EPRC) in Uganda; Adrienne Lucas is an Associate Professor of Economics in the Lerner College of Business and Economics at the University of Delaware; Derek Neal is the William C. Norby Professor in the Kenneth C. Griffin Department of Economics and the Committee on Education at the University of Chicago. This post first appeared on VoxDev and also appears on the IFPRI blog. The authors gratefully acknowledge funding from the International Growth Centre (IGC), the Post Primary Education Initiative (PPE) of the Abdul Latif Jameel Poverty Action Lab (J-PAL), the Spencer Foundation, the CGIAR Research Program on Policies, Institutions, and Markets (PIM), and Lindy and Michael Keiser for research support through a gift to the University of Chicago’s Committee on Education. 1. Duflo, A, J Kiessel and A Lucas (2018), "Alternative Models of Increasing Student Achievement: Evidence from a Nationwide Randomized Experiment", working paper.